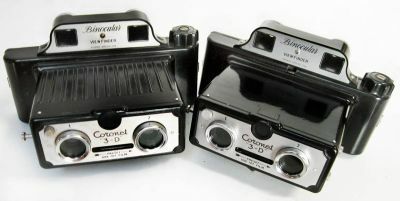 Two Coronet 3-D cameras. Binocular Bakelite Viewfinder cameras, 4 stereo pairs or 8 single exposures of 4.5x6cm on 127 rollfilm. Single speed shutter. There some body variations. Left: Ribbed Body, and the smooth body surface.